Now let’s talk turkey. We’ve reviewed a number of laptops that feature a Core i7-6820HK CPU, including the Asus G752 and the Acer Predator 17X, but none of them were equipped with the GTX 1080. The recently reviewed Origin EON17-X rocked the GTX 1080 but was paired with a desktop CPU — the Core i7-6700K — which was overclocked, to boot. But the Origin and MSI are extremely similar otherwise, even down to the dual PCIe SSDs, so this seems like the natural comparison. How much difference does the desktop CPU make compared to the mobile part? Let’s find out! 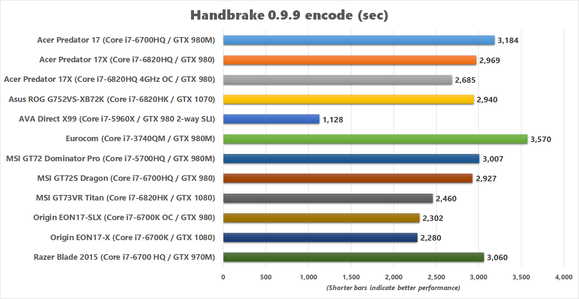 Thus the GT73VR was essentially tied with the Origin EON17-X, with just 100 points separating the two machines. The EON17-X had the upper hand, but in this test that’s the slimmest of margins and well within the margin of error. 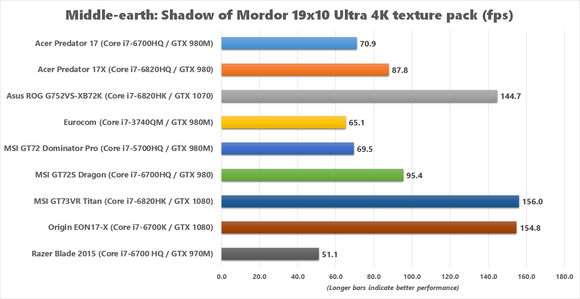 Since they both use the same GTX 1080 GPU, the parity was expected. It’s also noteworthy that the GTX 1080 machines held a 25 per cent advantage over the last GTX 1070 equipped machine we tested, the Asus G752. 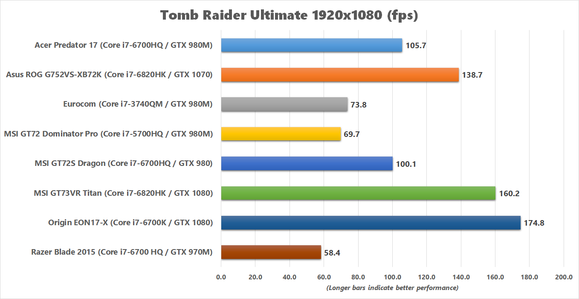 In Tomb Raider, the Core i7-6700K in the Origin EON17-X was able to assist the GTX 1080 quite a bit, as that laptop scored a decisive victory over the GT73VR Titan. 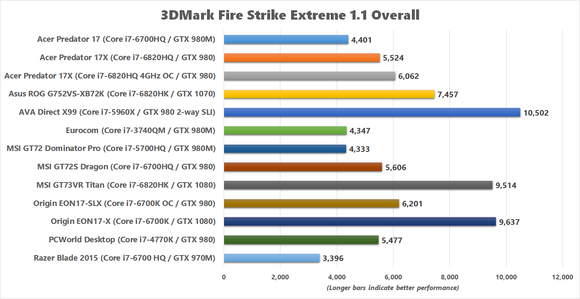 The performance difference between the two machines, despite having the same GPU, was a surprising 11 per cent, with both notebooks pushing more than 150fps at 1080p. It seems the extra clock speed of the CPU helped, because when we turned up the clock speed of the GT73VR the gap closed to just six per cent. It’s also worth noting that, compared to the GTX 1070-powered Asus G752S, the MSI GT73VR was only 16 per cent faster. MSI includes a software utility named Dragon Center that lets you tweak a bunch of the notebook’s settings, including overclocking the CPU (and the GPU). By default the CPU will boost up to 3.6GHz, but MSI provides sliders to adjust the multiplier for each core all the way up to 42, resulting in a clock speed of 4.2GHz.